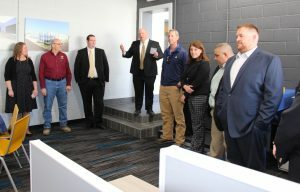 Erlanger, KY—Furlong became the client when they purchased, designed and renovated a building for themselves in late 2017. 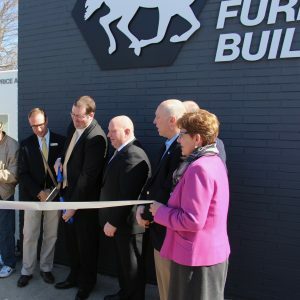 Today Furlong Building held a ribbon cutting ceremony at their new company headquarters at 12 Price Avenue, Erlanger, Kentucky. The original 1959 building housed light manufacturing companies throughout the years and sat vacant for several years before Furlong purchased the facility. The design included converting a dock door and warehouse space to office, conference, kitchen and tool storage areas. Furlong provided the interior design as well as the construction services. Furlong specializes in design-build construction, additions and renovations for commercial, industrial, office, medical and retail projects. The company currently has sixteen employees and was awarded the Tri-State Success Award by Cincy Magazine two years in a row. The company was named to the Business Courier’s Fast 55 list of the region’s fastest growing companies in 2013, 2015, 2016 and again in 2017, and has been named to the Northern Kentucky Chamber of Commerce Emerging 30 list of growing companies in 2014, 2016 and in 2017. Services are provided throughout the Tri-State and Midwest Region including Ohio, Kentucky, Indiana, Michigan and Tennessee. In 2017, the company completed its largest project to date, a 143,000 sq. ft. bulk warehouse in Monroe, Ohio. Furlong is currently working on its sixth brewery project and 63,000 sq. mezzanine for UPS in Richwood, KY, a renovation for Cincinnati Early Learning Center in Price Hill and a large tenant finish project in Monroe, OH for IDI.